Round 2: ch1, sc in same st, ch5, sk 2 dc, sc in the next dc, ch3, sk 2 dc, sc in next dc, ch5, sk 2dc, sc in next, ch3, sk 2dc, sc in next dc, ch5, sk 2dc, sc in next dc, ch3, sk 2dc, sc in next dc, ch5, sk 2dc, sc in next dc, ch3, sl st in the first sc. Round 3: sl st in the ch5, ch3 (counts as 1st dc) in the same ch5 make (2dc, ch3, 3dc), in the ch3 make 3dc, *in the ch5 me (3dc, ch3, 3dc), in the ch3 3 dc,* repeat from *to* 2 more times till you reach the ch3 from the beginning of your round, sl st with the ch3. Fasten off and hide all loose tails. Making 28 grannies in total. Round 1: Ch3, 2dc, ch3, 3dc in same st as ch3 , *sk 2st, in the 3rd ch make 3dc* repeat *to* 8 more times, (having 9 clusters of 3dc total), sk 2 st, in the 3rd (3dc, ch3, 3dc), repeat from *to* 9 times, sk 2 st, in the 3rd (3dc, ch3, 3dc), repeat from *to* 9 times, sk 2st, in the 3rd (3dc, ch3, 3dc), repeat from*to* 9 times, sl st in ch3 from beginning of your round. Round 2-9: Sl st in the sp you just made when ending your last round, Ch3, 2dc in same sp, (you will begin all your rounds like this), you will work 3dc in between the clusters from previous round and you will work in the ch3 space (3dc, ch3, 3dc) creating your corner st. Every round you are increasing a 3dc cluster so by your 9th round you will have 17 3dc cluster between the corners. When you are done with your 9th round fasten off. 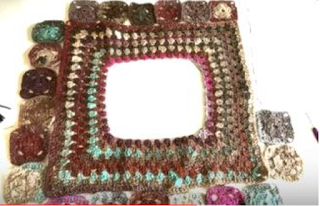 Now you will lay out your poncho and arrange your granny squares choosing the color arrangement you like. 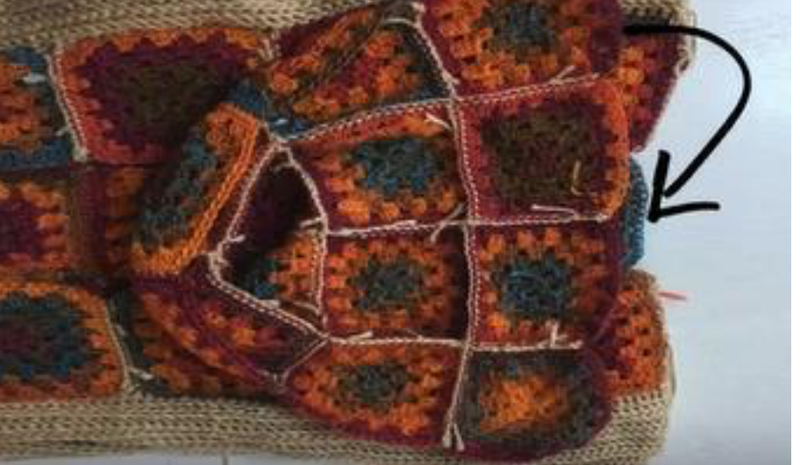 Now you will take 1 granny and the corner of your poncho, with right sides together, Joining your yarn to the 3rd ch of your corner, closest to the left. You will now sl st through the loop closest to you and the loop furthest from you on your work, matching st for st, now sl st along the granny, make 1 sl st in the first ch1 of your corner and stop, you will now add another granny, continue like this around your poncho. You will leave off your corners as they will be sewn in later. 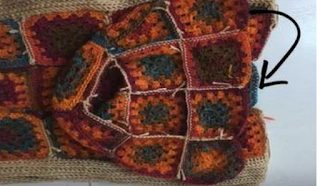 Once you are done attaching your grannies to your poncho you will sew the sides of the grannies together, take your tapestry needle and yarn, starting the corner of 2 grannies you will sew them the same way you attached the grannies to the poncho, through the loop closest to you and the loop furthest from you on your work. Sew each granny together as well as the 4 corner grannies this way. Round 1: Ch3, 2dc, ch3, 3dc in the ch3 sp, make 3dc in the sp between the cluster, continue like that working 3dc in between clusters and in each ch3 sp of each sewn granny until you meet the next corner of your poncho, in the ch3 sp make (3dc, ch3, 3dc) repeat this pattern on all 4 sides of your poncho, sl st with the ch3 from the beginning of your round. You will have 4 clusters of 3dc on each granny. Round 2-13: Sl st in the sp you just made when ending your last round, Ch3, 2dc in same sp, (you will begin all your rounds like this), you will work 3dc in between the clusters from previous round and you will work in the ch3 space (3dc, ch3, 3dc) creating your corner st. Every round you are increasing a 3dc cluster. When you are done with your 13th round fasten off and hide all loose tails. Fold 2 strands in half starting in a ch3 sp of a corner, insert your hook in the st, with the hook grab the yarn and pull through the st, sl the strands though the loop and pull snug. Continue along adding 2 strands in the sp between clusters, every middle dc of the cluster and in each ch3 corner space. 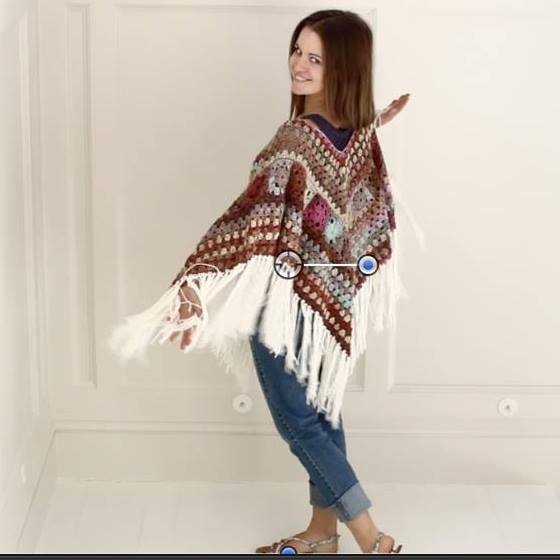 You are done with your Poncho!!! Row 1: hdc in the 2nd ch from hook, hdc in each of the next 18ch, in the last ch make 2 hdc, ch2, 2hdc, hdc along the other side of the chain total of 18 hdc. Total of 21hdc on each side of the ch2. Row 3: ch1 turn your work, hdc in the first st, 1 hdc in the next 22 st, in the ch2 space make 2hdc, ch2, 2hdc, 1hdc in the next 23 hdc. Total of 25hdc on each side of the ch2. Row 4: ch1 turn your work, hdc in the first st, 1 hdc in the next 24 st, in the ch2 space make 2hdc, ch2, 2hdc, 1 hdc in the next 25 hdc. Total of 27hdc on each side of the ch2. Row 5: ch1 turn your wok, hdc in the first st, 1 hdc in the next 26 hdc, in the ch2 sp make 2hdc, ch2, 2hdc, 1hdc in the next 27 hdc. Total of 29hdc on each side of the ch2. Row 6: ch1 turn your work, hdc in the first st, 1hdc in the next 28hdc, in the ch2 sp make 2hdc, ch2, 2hdc, 1hdc in the next 29hdc. Total of 31hdc on each side of the ch2. Row 7: ch1 turn your work, hdc in the first st, 1hdc in the next 30hdc, in the ch2 sp make 2hdc, ch2, 2hdc, 1hdc in the next 31hdc. Total of 33hdc on each side of the ch2. Row 8: ch1 turn your work, hdc in the first st, 1hdc in the next 32hdc, in the ch2 sp make 2hdc, ch2, 2hdc, 1hdc in the next 33hdc. Total of 35hdc on each side of the ch2. Row 9: ch1 turn your work, hdc in the first st, 1hdc in the next 34hdc, in the ch2 sp make 2hdc, ch2, 2hdc, 1hdc in the next 35hdc. Total of 37hdc on each side of the ch2. Row 10: ch1 turn your work, hdc in the first st, 1hdc in the next 36hdc, in the ch2 sp make 2hdc, ch2, 2hdc, 1hdc in the next 37hdc. Total of 39hdc on each side of the ch2. If you need a larger size cup, continue to increase for a few more rows proceeding the same way, until you find the size that fits you. Now make a second one, but DO NOT fasten off at the end of row 10. You will now make a chain for the back of your Top. For this size, I made a chain of 60. You can change that if you need to by adding more chains in a multiple of 4 to fit across your back. Also if your change the amount of chains you will also need to adjust the front stitches, to do so use the below formula to determine how many sc will go on each of your triangle tops. 28 sc will be evenly spaced along the bottom of each triangle top. Ch60, sl st to the bottom corner of your second triangle, sc 28st evenly across the bottom of your triangle top, ch4, making sure the chain from your back is not twisted you will sl st to the corner of the first triangle and sc 28st evenly across the bottom. Working in rounds now, starting at the beginning chain for the back. Round 2: you will sc in each dc you have made 120 sc in total. Round 13: ch4 sk 3st sc in the 4th repeat this all around, at the end of the round sl st to the last st and fasten off. This row will provide the loops for your fringe. 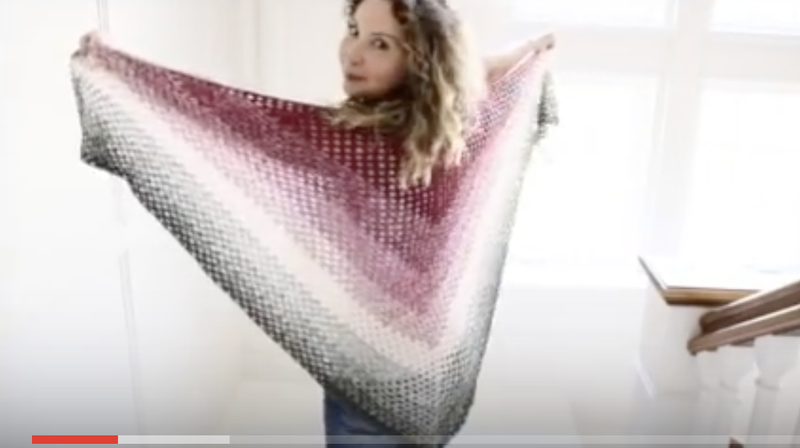 Begin at the Right triangle top where the back and triangle meet (right side) and with the right side facing you join your yarn in that first st of the triangle. Row 1: sc in same sp as joined yarn, *ch3, sk 2st, hdc in next st* repeat *to* till you reach the ch2 sp of your triangle, in the ch2 sp you will ch3, hdc, ch3, hdc, repeat from *to* along the other side of your first triangle till you reach the beginning of the ch4 between the 2 triangles, ch2, hdc in between the 2 4dc clusters, ch2, hdc in the first st of the second triangle, repeat from *to* till you reach the ch2 sp, in the ch2 sp ch3, hdc, ch3, hdc, Repeat from *to* along the other side of your second triangle till you reach the last st, you will now sc along the back like so, 3sc in the ch3 sp, 1 sc in the bottom of the cluster, repeat that around till you are back where you began, sl st with the first sc. Row 2: Skip to the first ch3 sp,* hdc, dc, hdc in ch3sp, sl st in hdc from previous round,* Repeat from *to* till you meet the ch2 sp in between the 2 triangles, in first ch2 sp you will make hdc, dc skip to the next ch2 sp and dc hdc, sl st in hdc from previous round, Repeat from *to* around the next triangle till you reach your back, once you are at your back sl st in next st. Fasten off your work. With yarn and hook join to the top of the triangle, Refer to the video tutorial at the 22:58 minute mark. Ch100, you will make a little bobble at the end of your strap, in the 3rd ch from the hook, Yarn over, insert hook in 3rd ch from hook, Yarn over, pull the yarn through the stitch, pull the loops so they are all the same length, in the same ch, YO, insert hook in same sp, YO and draw through the st, pull the loops so they are all the same length, repeat this again 3 more times till you have 11 loops on your hook, Yarn over and pull through all 11 loops, ch1 and sl st in the next ch, sc in each ch along your strap till you are back at the triangle, sl st to the top and fasten off. You can skip the bobble if you wish and just sc in the 2nd ch from hook and sc along the ch till you are back to the top of the triangle, sl st to the top and fasten off. Repeat for the other triangle. Hide all loose threads. Refer to the Video Tutorial at the 25:50 minute mark. Cut strands of yarn about 20 inches, use about 6 strands for each loop on your top for your fringe. Fold strands in half, in a ch4 space from the bottom edge of your top, insert your hook and grab the folded strands, pull through but not all the way just enough to pull the loose ends through the loop. Pull the loose strands through the loop and pull snug, repeat this all around. Row 1: ch5, in the first ch you made make 3 dc in the same st, ch2, 3 dc in the same st, ch1, make Tr (treble crochet) yo twice, insert hook in same sp, yo pull though st, yo pull through 2 loops, yo pull through 2 loops, yo pull through last 2 loops. Row 3: Ch5, 3dc in ch1 sp, ch1, 3dc in ch1 sp from previous row, ch1, in the ch2 sp of your middle st (3dc, ch2, 3dc) ch1, 3dc in ch1 sp from previous row, ch1, 3dc in ch5 sp from previous row, ch1, Tr in the top of the 4th ch of the ch5. Turn your work. ch5, 3dc in ch1 sp, ch1, 3dc in each ch1 between clusters from previous row till you reach your ch2, you will work a (3dc, ch2, 3dc) in that sp, ch1, 3dc in each ch1 between clusters from previous row till you reach the ch5 sp, ch1, 3dc in ch5 sp, ch1 Tr in the 4th ch of the ch5. 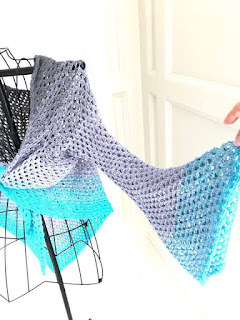 You will continue this until you are happy with the length of your shawl. If you want to make this a vest follow below for more instructions. Row 35: Begin your row as you have done before, make 7 clusters of 3dc, ch48, sk12 3dc clusters, at the 13th cluster continue with the pattern as you have been doing till you meet the ch2 sp, work (3dc, ch2, 3dc) in that sp, work 13 3dc cluster, ch48, sk12 clusters, and make the last 7 clusters ending with a Tr in the 4th ch of the ch5. Turn your work. Row 36: Begin your row as you have done before making your 3dc clusters until you meet your ch,* in the first ch from the previous row you will make 3dc cluster, ch1, sk3 ch, in the 4th ch make 3dc, ch1, repeat that 12 times until you reach the end of your ch (you will have 12 3 dc clusters along your ch) *continue with your regular pattern until you meet the next ch, repeat from *to* , continue with your pattern as you have been doing before. Turn your work when you are done with your row. Continue increasing your rows like you have been doing prior to the armhole opening, until you reach your desired length. If you are using a gradient yarn, take a length of yarn about 2ft and put it aside. You will do this now so your seem will be seamless. Rows 2-11: Turn your work, sl st over the next 3 dc, and sl st in the ch1 sp, ch3, in the same sp make 2 more dc, ch1, in every ch sp from previous round you will make 3dc, ch1. You will now begin working in the round DO NOT turn your work. Refer to the Video Tutorial at the 9:29 minute mark for help. If you want you can stop here for a 3⁄4 length sleeve or you can continue with Rounds 13-14 until you reach the length you want for a straight sleeve. Refer to Video Tutorial at the 13:28 minute mark. Round 23: Increase round, remove your st marker, in the ch1 sp make 3dc, ch1, 3dc, place st marker in the ch1sp, ch1 ( 3dc in ch1sp, ch1) 7 times, increase again, in next ch1 sp 3dc, ch1, 3dc, ch1 continue with 3dc in the ch1 sp, ch1 around to the st marker. remove your marker and place it in the ch1 between the increase, continue to 3dc in ch1 sp, ch1 to the ch1sp before the next increase from the previous increase round, in that ch1 sp 3dc, ch1, 3dc, ch1, continue with 3dc in ch1 sp, ch1 until you get to the st marker. When you are done you will sl st in the beginning of the ch1 sp of the last round you have just made. Fasten off and sew in loose tails in the wrong side of your work. Now take your scap length of yarn and you will begin to sew the opening of your sleeve. Refer to Video Tutorial at the 19:44 minute mark for more help. 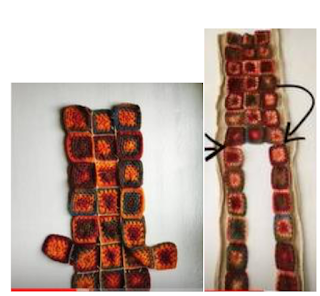 With your sleeve wrong side out, you will begin with the first row of your sleeve, picking up the left and right sides of the cluster at the top of the dc and sew in that space, you are trying to recreate that ch1 sp so you only want to sew the top of the cluster together not the whole dc. You will weave your yarn up one side of the dc to the top of the next rows cluster picking up the top of the other side and stitching it closed, repeat that all the way up the opening of the sleeve, Hide all your loose tails. Repeat the sleeve pattern for the second sleeve. Making sure if you are using a gradient yarn to leave a 2 ft strand from the beginning of your yarn to sew the opening closed for the second sleeve. Possibilities are endless with this coat. Below are some suggestions on how to make it larger or shorter. 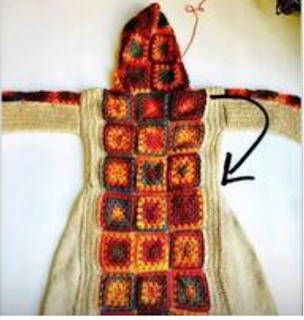 You can make this Larger by adding more rows to the sides of the coat and to the sides of the arm. Try the coat and arms as you go to get the fit you like. you have 3 rows of your desired length and 2 for the front. Your side triangles will also be shorter as well. But continue with the pattern from the Side borders. Example: you like the 6 granny length, you will make 3x6 for the back and 2-1x6 for the fronts. Assemble them like you would the 7 and continue on with the pattern. For this size coat, you will make 47 Grannies. Round 1: ch3 (counts as first dc), in the magic circle 2dc, ch1, 3dc, ch1, 3dc, ch1, 3dc, ch1, sl st in ch3. 4 clusters of 3 dc. Pull the string from the magic circle closed. Round 2: Ch3, in the ch1 space before the ch3 you just made work 2dc (you will do this for every round), in the next ch1 space work a corner cluster( 3dc, ch1, 3dc), repeat in the next 2 ch1 spaces, in the last ch1 space there will be 3 dc already, you will work 3dc and a ch1, sl st to the top of the ch3. Round 3: Ch3, in the same space 2dc (first half of the first corner), *3dc in space between 3dc cluster from previous round, in the ch1 space of the corner work a corner cluster (3dc, ch1, 3dc)* Repeat *to* 2 more times, 3dc in space between 3dc cluster from previous round, in the last corner finish the second half of the cluster (3dc, ch1 ), sl st at the top of ch3. Round 4-5: Repeat round 3, You will be increasing a 3dc clusters in between the corner clusters by 1 for every row. So round 3 has 1 3dc cluster, round 4 will have 2, and round 5 will have 3 clusters in between corner clusters. Fasten off and sew in loose tails. When you have your 47 Grannies now it is time to assemble them. Refer to the Video Tutorial at the 14:13 minute mark. Assemble the back first, you will need 21 grannies for this size. Laid out 7x3. You will assemble all your grannies this way: Sl st in the loop that is closest to you on the first granny and through the loop that is furthest from you on the second granny. Matching stitch for stitch on both grannies. 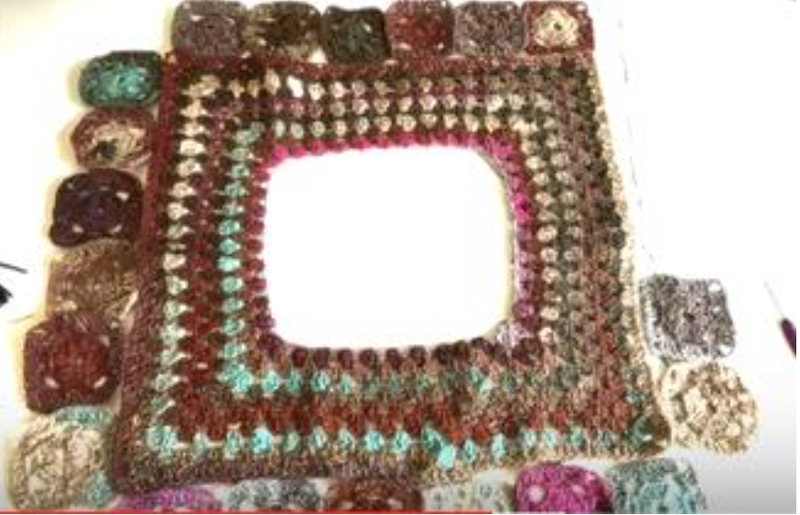 With your Bone yarn and 5mm hook take 2 grannies right sides together, join in a ch1 corner. You will assemble 7 grannies, one on top of the other. Make 5 of these rows. 3 are for the back and 2 for the front. You will now assemble 3 of the granny strips you made. Place them right sides together and Sl st along the 7 grannies making sure to match the st and picking up one st at each seam, repeat for the 3rd strip of grannies. You will now assemble the hood, Assemble using the sl st like you have been doing so far. Making a 4x3 rectangle. Assemble 3 strips of 4 grannies, when those are together you will attach the 3 strips together just like you did for the back. Once your rectangle is done lay it right sides facing you 4 grannies across and 3 down, take the 2 corners from the top and bring them together. You will have 2 grannies on each side of your fold. Join your yarn in the ch1 corner and sl st as you have before across these grannies. Put your Hood aside for now and now it is time to attach the 2 front strips with the back. With right sides facing, take the back and the front strips attaching one front strip to either side. From the shoulder edge you will join your yarn in the ch1 of the corners and sl st like you have been but only through 6dc, fasten off and repeat the same for the other side. Row 1: Ch3, *dc in each dc from your granny till you reach a seam, before the seam dc in the ch1 sp, dc in the ch1 sp in the next granny,* repeat form *to* all along the edge of your work, till you reach the bottom of your front. Row 2: Ch3 and turn your work, BP dc in every dc across. Row 3: Ch3 and turn your work, FP dc in every dc across. Row 4-6: Repeat rows 2-3. Fasten off, hide all loose tails. Repeat this for the other side, starting at the Front bottom ch1, right side facing you. You can try on your coat now just to see how it will fit, if you want your coat to be larger here is where you will make your coat wider, just add extra side rows and be sure to end on a Row 2. Make the same number of rows for the other side as well. 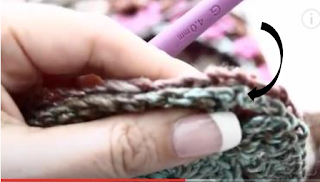 With your 4.5mm crochet hook, make 8 grannies like you did before stopping at the 4th round. 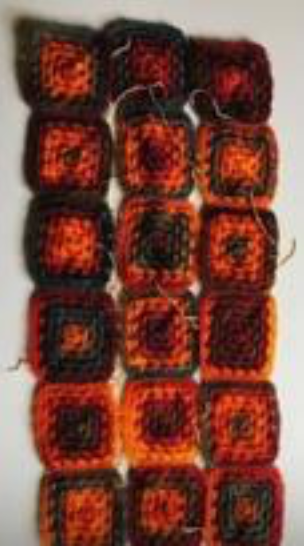 Assemble 2 strips of 1x4 grannies the same way you have assembled before with your Bone yarn. Once you are done attaching your strips for your sleeves you will now work on the sides just like you did for the side border of your coat. Row 1: ch3, *dc in each st till you reach your seam, 1dc in ch1 before the seam and 1dc in ch1 after the seam,* repeat *to* to the end of your sleeve. Row 2: Ch3, turn your work, BP dc in each dc across. Row 3: Ch3, turn your work, FP dc in each dc across. Row4-12: Repeat rows 2-3 fasten off and repeat for the other side of your sleeve. Repeat this for the second sleeve. If you need your sleeve to be larger just add more rows ending with a row 2. Making sure to make the same number of rows for each side of your sleeves. Now it is time to assemble your sleeves to your coat. Refer to the Video Tutorial at the 31:07 minute mark for help. What you want is the middle of the sleeve granny to line up with the shoulder seam. You can use some safety pins and pin your sleeve in place before you sl st it together. Making sure the right sides are facing each other when you sl st together. Join your yarn at the center of your sleeves granny and sl st the sleeve and coat together, then repeat for the other half of the sleeve. Do this once more for the second sleeve on the other side. Now you will sew the waist of your coat and your sleeves, turn your coat wrong side out and lay it flat matching the front to the back. Count down 3 grannies from the shoulder or 2 grannies from under the sleeve. From there, with your 5mm hook, you will join your Bone yarn and sl st like you have, through the back loops, sl st up the side to the sleeve, then sl st along the side of the sleeve matching the st.
Fasten off and hide loose tails. Repeat for the other side. You will have 2 side openings where your Triangle pieces will go to make your coat flare at the bottom. Refer to the Video Tutorial at the 36:23 minute mark. Lay your coat, still wrong side facing you, on a flat surface. Take hood at the middle seam of the 4 grannies and you will match it with the middle st of the middle granny from the back. You will lay your hood wrong side facing you like so in the photo. You will join your yarn in the middle st of your back granny and middle seam of your hood, working one half at a time, making sure you have wrong sides facing out and right sides facing each other. You can use safety pins to pin your hood to the back and front of your coat. Sl st as you have done before stitching together your hood along the back and when you reach the end of the back. You will now attach your hood to the front, making sure your work is right side facing each other. If you need help refer to the Video Tutorial at the 38:33 minute mark. You will repeat this for the other half of your hood. Row 1: Ch3, *dc in each dc along the grannies, just before the seam, dc in the ch1 and right after the seam dc in the ch1* Repeat from *to* till you reach the bottom of your coats other side. Row 2: Ch3, turn your work, dc in each dc around to the other side of your coat. Row 3-4: Repeat row 2. Fasten off and hide all loose tails. 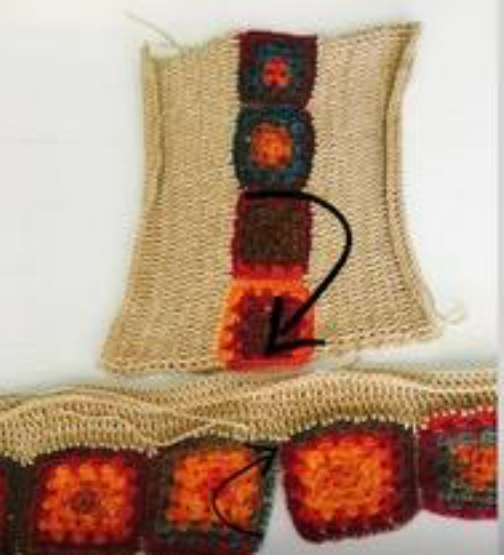 You can make this wider or shorter if you want, trying on your coat until you are happy with the length of your border. Row 2: sc in each sc (3sc), turn your work. You will continue to increase making 2 sc at the beginning and end of one row and work 2 rows even until you have 41 sc on your row. Once you have that you will sc evenly for a total of 104 rows, or until the triangle fits your side opening. Measure it as you go to determine how long you need your triangle to be. (if you have shortened your coat you will shorten your even rows as well, if you feel the triangle is too wide you can make less increase rows also) DO NOT Fasten off. Now it is time to sew your triangle to your coat, starting with the right sides facing each other and the point of your triangle at the side seam, you can place a safety pin to hold it in place, you will sl st one half together first, working from the bottom of your triangle and coat to the point of your triangle, stopping just before the point, making sure to match each st as you go. Fasten off and leave a 10inch tail to sew down the point later. You will work the other half of your triangle the same way starting at the bottom and sl st in the back loops like you have done throughout this pattern, to just before the point, making sure to match sts as you go. Sew the point in place refer to Part 2 of the Video Tutorial at the 7:31 minute mark. Make another Triangle the same as your first and repeat the assembly process again. Now is the time to hide all loose tails if you haven’t done so already. Row 1: In the same st 1sc, sc in each st along the inside band until you reach the bottom corner of your coat, when you reach a corner you will make 3sc , when crocheting in the sides of a dc row (along the bottom) you will make 2sc in each dc row, sc in each st of your granny across, 2sc in each dc row till you meet your triangle, sc in each sc across your triangle, again 2sc in each dc row, sc in each st of your grannies on your back, 2sc in dc row, 1sc in each sc of your next triangle, 2sc in each dc row, sc in st of granny, 2sc in each dc row, 3 sc in the corner, sl st with your ch1 from the beginning round. Row 2: (picot row) Ch1, sc in same sp, *ch3, sl st in base of the ch3, sc in the next 2 sc, Repeat from *to* around till you reach the ch1 of the beginning of the round, sl st and fasten off and hide loose tails. Repeat for the other sleeve. That is it you are done with your Beautiful Boho Granny Coat. If you would like you could add a belt to your coat, buttons, a zipper you could even line it. You will need some sewing skills for that, but the Possibilities are endless.